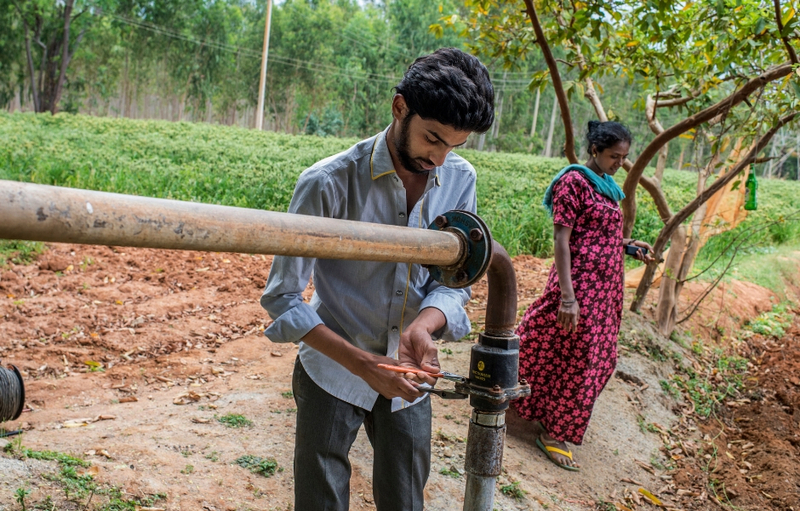 Chidan and Field assistant opens bore well pipe to collect the ground water measurement from the farm of Subbanna. Through their National Adaptation Plans, developing countries have established ambitious roadmaps to align with the Paris Agreement, but the urgent need to finance these plans surpasses their domestic financial capacity. To this end,addressing the gap in climate financing options, mobilizing private sector actors, and creating innovative financial instruments are crucial to help developing countries adapt to a climate that is changing more rapidly than anticipated. compensating the private actor for the effects on the risk-return profile. Without correcting the market imperfection, commercial actors can be compensated for the negative effects on their risk-return profile. The development of more comprehensive market instruments will help overcome several of the barriers to private sector investment in adaptation. Clean technologies and renewables have traditionally attracted private sector investment because their benefits, which address the risk posed by limited supplies of finite resources and the massive growth opportunity they present, are more tangible than those presented by adaptation strategies. For private sector financing to meaningfully shift into the adaptation space, new models are needed that satisfy the private sector’s primary motivation to achieve an appropriate return on investment. New models, such as those created by the Private Finance Advisory Network, bring impact investors together with adaptation-focused micro, small, and medium-sized enterprises (MSMEs). A group of selected MSMEs participated in an intensive coaching process to provide support and advice on project development, sourcing financing, refining investor-ready proposals, and developing bankable business plans. This work eventually created a pipeline of bankable adaptation projects offering the potential to attract private sector financing. These are important initial steps, with much work to be done in testing the private sector response to such models and ensuring they are framed in a way that speaks to private sector needs and motivators. The Framework for Private Sector Action on Climate Resilience, developed by Business for Social Responsibility, presents an accessible and actionable framework for private sector leadership on climate change resilience. This framework also underscores that climate change is a material risk to the private sector, with implications across their operations, supply chains, and in the vulnerable communities where they operate. The capacity of this framework’s ability to assess the climate risks within a company’s operations, supply chain, and the communities in which they operate is an example of innovative strategies and new approaches to motivating private sector engagement. A second example is found in “B Corporations” (B Corps) in Latin America. These social enterprises, also known as hybrid companies, are committed to fostering greater climate change resilience by leveraging the power of the private sector for socially, environmentally, and economically sustainable ends. This type of hybrid company helps reduce the gap between mitigation and adaptation investments and highlights the co-benefits of addressing both challenges simultaneously. Knowledge brokers can also support access to climate finance for developing countries. For example, the “Climate Finance Ready” portal, developed through a partnership between the Adaptation Fund and the Climate & Development Knowledge Network, offers information, advice, and case studies to support developing countries in their efforts to access climate finance. Governments and public finance institutions can support businesses to move into the climate financing space by promoting enhanced knowledge generation through, for example, sharing climate data and risk assessments, facilitating innovation through support for research and development, or by compensating for a technology spillover. There is little enabling policy to encourage the integration of resilience thinking in corporate strategy and investment decisions, but multilateral development banks (MDBs) can mainstream resilience thinking into development financing strategies. Further, climate resilience needs to be mainstreamed into development planning. More work is required to address the gaps as to how MDBs are approaching climate change adaptation and resilience financing and how public policy and risk mitigation instruments can remove the barriers to private sector investment. Developing countries face a gap in their capacity to design and implement unique interventions that both address the needs of their communities and that mobilize public and private financing. To help narrow this gap, an increased focus is needed in identifying and supporting the next generation of climate adaptation leaders in developing countries. Fostering shared lessons and peer learning among these leaders — and equipping them with state-of-the-art knowledge on adaptation finance — will help them become “climate ambassadors”, whether they work in the scientific community, the private sector, or as policymakers. Adapting these and other measures can help developing countries fund their ambitious roadmaps to climate change resilience and adaptation.